Here are some important places where you can find information about our meet-up and meet other Cohenites! Our central meeting point will be the Roloi Tavern in the harbor, next to the clock tower. Roloi's friendly staff is ready to serve us day and night! Program updates will be on a table indoors, and also two lists for the cinema nights. Please sign your name either to the Friday screening or Sunday screening. We have 130 seats for each at the Cinema Club. The concert will be the same on both nights. Our local organizer is our old friend Lakis Christidis. Lakis is going to guide the Epidaurus trip on Friday, and he is also boss at the Hydra Cinema Club. 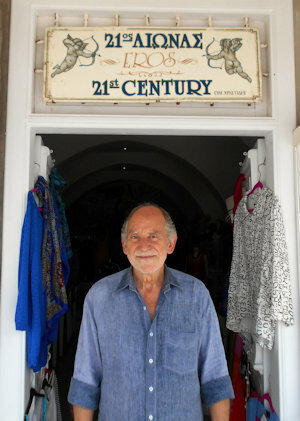 You may find him at his shop 21st Century in the harbor, close to the Alpha Bank and opposite to the Donkey station. Drop in if you need some information about Hydra. His shop also offers a large variety of jewelry (gold, silver, stones), clothing, shoes and accessories. I'm going to post the meet-up program on Monday and also send it to all our 200 participants. Some timings for Saturday afternoon/evening remain open but otherwise we are now able no nail the plans. For those unaware, the Roloi (where I am typing this right now) was Katsika's grocery store. The doorway was where Leonard first invited Marianne to join his table.